What kind of charging infrastructure do employees need at their workplace? 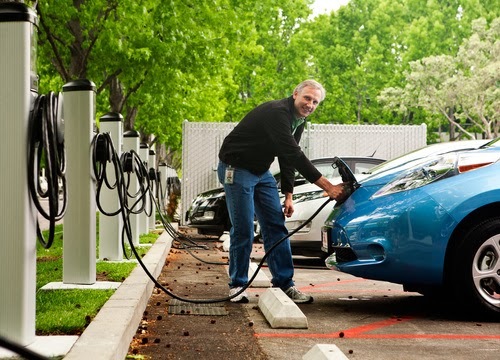 Most electric car driving employees will require access to a charger during the work day. In some cases it will be a matter of convenience, but depending on an individual’s commute access to charging at work is an absolute necessity. 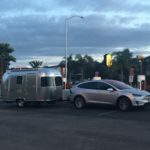 Electric vehicle activist Marc Geller just penned a blog post advocating for Level 1 charging, because the lower cost should make for more charging opportunities, giving more prospective EV owners the reassurance that they’ll be able to charge their cars. Charging ones electric car at work is one of the common electric car charging scenarios . It’s a form of “destination charging” meaning where you charge up at the destination while taking care of other business. Employers have other considerations and aren’t always keen to allow their employees to charge while at work. Back in 2010 I wrote about an electric car driver in Merced whose employer loved the conversion car he’d built, but wouldn’t allow him to charge the car at work . Some employers feel they cannot offer a perk to one group of employees and not offer the same to others. 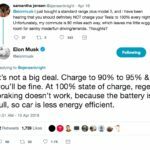 Why should EV owning employees get free fuel from the employer, and others do not? Well, as an electric vehicle advocate, I think the answer is that we want to encourage electric car ownership, and this is one way to do so. But projecting into the future where electric cars are common-place, should employers continue providing free fuel? If not, then how would they convert their employee base from receiving free fuel to paying something for the electricity they use to refuel their cars? But let’s get back to Marc’s issue about Level 1 charging outlets for electric cars . His example is a San Francisco Police Officer who owns a Leaf, and has a commute long enough that he must recharge during the day in order to return home. Originally his boss said it would be okay to use a 120 volt outlet (Level 1 charging) while at work. But that boss moved to a different job, and the new boss won’t allow him to use the power outlet. This is just what happened to the fellow in Merced mentioned above. In this case, the infrastructure is more mature than it was in 2008, and Officer Bill can use the fast charging stations which exist now. Meaning, he’s doing a fast charge every day, at a fairly high cost, when previously the 120 volt Level 1 charging outlet had been sufficient. Marc’s point is that this proves that even lowly Level 1 charging infrastructure is important for electric car owners. Officer Bill, like many, don’t need Level 2 charging to get enough recharge to return home. I agree with Marc – there are plenty of scenarios where even 120 volt outlets are sufficient. 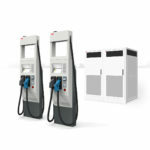 The installation cost for 120 volt Level 1 charging can be much less expensive than installing the regular Level 2 EVSE’s. The 120 volt outlet itself costs a fraction of Level 2 EVSE cost, or a few hundred dollars versus a couple thousand. The service panel capacity required is very different, being a 120 volt 20 amp circuit versus a 240 volt 40 amp circuit for the Level 2 EVSE. The wiring is also less expensive due to being able to use thinner gauge wires. Therefore, with the same budget one can install many more Level 1 power outlets than Level 2 EVSE’s. An example I wrote about lately, on PlugInCars , is an installation of Level 1 charging at the Denver airport. They worked with Telefonix, who has developed what looks like a Level 2 EVSE, but runs at 120 volts (Level 1) to capture most of the savings mentioned earlier. The stations are installed in the Denver Airport’s long term parking, a place where the natural use case involves parking for several days at a time and the recharge time simply is not important. Another example of a Level 1ish EVSE with J-plug comes from At Work Charging. Their product clamps to light poles that already exist in parking lots. Because they run at a low charge rate, thinner wiring can be run through the conduit that already exists, meaning there’s no need to run new trenching for EVSE installation. Installation cost is therefore very low. However much as I agree with Marc, and want to see more Level 1 charging outlets available in the public, let me raise some counter points. Measurement / Management: The employer might want to track the cost for providing charging services to their employees. At the macro level “we” need better data on the relative popularity of Level 1 charging versus Level 2 charging. As Marc pointed out in a different blog post , the data currently available is provided by the charging station networks and therefore completely leaves out the use of Level 1 charging. We’re getting a badly skewed picture of the charging that’s actually occurring in the world, because no data is being collected for Level 1 charging. But, how do we measure utilization of the cheap 120 volt power outlet? The reason they’re so cheap is that the outlet’s have nothing fancy in them. No embedded computer, no Internet connection for remote management, no RFID scanners, no J1772 hose, etc. Marc suggests that facility owners should send people out with clipboards to measure utilization, but doesn’t that add to the cost of providing charging services? It’s feasible to design a 120 volt power outlet that connects to the Internet for remote monitoring and management, but that would add to the cost. We’d be stepping onto a slippery slope that probably ends up at a J1772 EVSE. Sharing power over multiple EVSE’s: The prevailing model for EVSE installation is to have one circuit breaker per EVSE, or per 120 volt outlet. That one-one relationship between power outlets and circuit breakers makes for wasted capacity at the electrical service panel. Service panel capacity can constrain the total number of charging outlets in a huge way, because the cost of a service panel upgrade can swamp the savings of using 120 volt charging. While use of 120 volt Level 1 charging would stretch the capacity of the service panel, you’re still talking about a one-one relation between circuit breakers and power outlets. What’s needed for scalability is a way that’s approved by the electrical code to share circuit breakers between charging outlets, for better service panel capacity utilization. For example the ChargePoint CT4000 series of Level 2 EVSE’s can support two J1772 charging hoses sharing one 240 volt 40 amp circuit. The charging station intelligently shares the circuit between the two J-plugs. 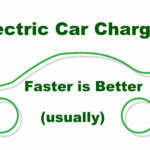 Smart Grid: Integrating electric car charging with the Smart Grid is still a research project. The vision is for electric cars to act as a giant storage battery to improve grid reliability, and earn some revenue for the electric car owners. The typical 120 volt power outlet is unlikely to be integrated with the Smart Grid. 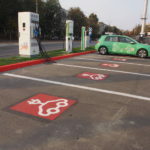 The entities that hope to make businesses around electric cars and the smart grid want access to larger power levels than can be done via a 120 volt outlet.